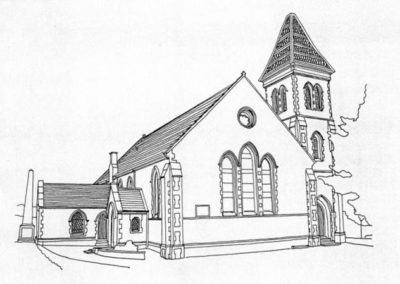 The parish church on an ancient ecclesiastical site, largely rebuilt in 1730, was by the middle of the next century thought to be ‘an old mean-looking edifice’. A new church, by the London architect Henry Roberts, was built nearby in 1851, still using the Georgian T-plan with a French pavilion roof on the tower. Built of granite, it encloses a broad nave and east transept. P MacGregor Chalmers added a communion table and font, an organ chamber, and rearranged the seating in 1914. In the transept are three carved stones, one a Celtic cross shaft decorated on both faces with interlaced rings, similar to those of the same period at Whithorn. Stained glass in the east transept window by James Ballantine & Son 1867.